According to a study reported in Energy Research & Social Science, failure to reduce the energy consumption by Bitcoin and analogous Blockchain designs can prevent countries from fulfilling their climate change mitigation commitments under the Paris Agreement. Jon Truby, PhD, Assistant Professor, Director of the Centre for Law & Development, College of Law, Qatar University, Doha, Qatar, authored the study, which assesses the legal and financial options available to lawmakers to regulate the energy consumption of blockchain technologies and nurture an innovative and sustainable technology sector. Considering this stringent analysis and review of the jurisdictional case law and practices, technologies and ownership models, the article proposes a method that imposes new charge, taxes, or constraints to lower the demand by miners, miner manufacturers, and users who use polluting technologies, and also provides incentives that inspire developers to produce Blockchain that is less energy-intensive and carbon-neutral. 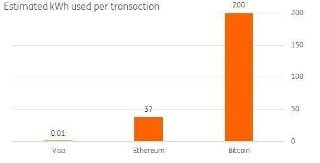 Digital currency mining is the first major industry developed from Blockchain, because its transactions alone consume more electricity than entire nations. It needs to be directed towards sustainability if it is to realize its potential advantages. Blockchain technology is a digital ledger that is used and trusted by all participants. It decentralizes and changes the exchange of assets via peer-to-peer substantiation and payments. It has been advocated that Blockchain technology can deliver social and environmental benefits under the Sustainable Development Goals of the UN. Yet, the system of Bitcoin has been developed in such a way that it reminds of physical mining of natural resources – as the system reaches the final resource limit, efforts and costs rise while the mining of novel resources needs more and more hardware resources, which use a great deal of electricity. Putting this concept into perspective, Dr. Truby stated, “the processes involved in a single Bitcoin transaction could provide electricity to a British home for a month – with the environmental costs socialized for private benefit. Registration fees gathered by brokers from digital coin buyers. Green taxes and limitations on machinery imports/purchases (for example, Bitcoin mining machines). Dr. Truby said that while these discoveries may lead to new charges, taxes, or constraints, they may also result in financial rewards for innovators creating carbon-neutral Blockchain.